A staple of AZ Roots is showcasing local talent, which continued in full fashion on the side stage with The Yoties followed by the fun-loving bunch known as Clint Stevens. The main stage welcomed Trevor Hall before the GRAMMY-nominated talent of J Boog took over to much applause. With glorious colors stretching across the sky at sunset, Mike Love closed down the side stage preaching messages of love and respect for all humans before the highly-animated hip hop duo Atmosphere hyped up the night. Switching between holding up middle fingers with holding up each other's hands in unity, Slug of Atmosphere's conscious rap evoked raw emotion for all. Last, but far from least as it was only Day One, Cali Roots veterans Rebelution became the first headliner of AZ Roots! Stay tuned for Day Two coverage coming soon. East coast self-proclaimed “progressive roots” reggae band on the rise, One Culture, celebrates new music as of today! The latest single, “Take Control” featuring Tony Brand of Cultivated Mind, follows in the band's known activist agenda with a clear call to action: let's take back the planet after centuries of destruction and “build a better world with the pieces left”. With a peaceful, traditional reggae beat and cooing backup vocals, singer Kurt Jansohn chants, “Evil is the disease and all greed is a contagion // Love is the antidote and unity is the foundation.” With these words in mind, “Take Control” unfolds as an uplifting deliverance in a world of confusion. “Take Control” unfolds as an uplifting deliverance in a world of confusion. This ecocentric song coaxes listeners to look into sustainable energy while loving one another a little more than we're accustomed to. Don't feel we're too far gone; our way of life needs work, but at least we have each other to lean on as we implement change. A smooth saxophone on the bridge emphasizes that we shouldn't be stressed or anxious about taking action either… we can accomplish anything if we do it wholeheartedly and systemically. Enjoy the exclusive stream of the new single below and look for “Take Action” to hit all digital outlets this Monday, February 25th! With the statuesque Queen Mary, the glistening Pacific Ocean and the stunning Long Beach skyline as the festival back drop, sold out crowds packed the cold and wet Queen Mary Events Park on Friday February 8th for Day One of the 4th Annual One Love Cali Reggae Festival. LA-based Arise Roots kicked the day off on the Koi CBD Main Stage, placing their unique imprint on the reggae genre, as always. In support of their latest album Longshot and here for their third One Love Cali Reggae Fest appearance, Passafire could be heard kicking off the SMKFLWR Side Stage. The boys were nice enough to interview that day, so stay tuned for a Top Shelf exclusive coming soon! With the recent release of their first new music since 2001, Long Beach Dub Allstars took to the Koi Stage. New York based ska-punkers, The Slackers, kept things rocking on the SMKFLWR stage. Uncle Don Carlos brought old-school reggae vibes while Ballyhoo!, promoting their latest album Detonate, kept fans dancing across the venue. Battling through sound issues like pros, The Expendables played a powerful set and explosive set on the Koi CBD Stage, giving fans a taste of what to expect on their upcoming Winter Blackout tour. They played a few fun covers such as Dre and Snoop's “Just Chill Til the Next Episode” and Afroman's “Because I Got High”. Fans flocked back over to the SMKFLWR Side Stage to see Los Angeles-based Iya Terra's Roots-Reggae sounds, covering Bob’s “Exodus” in between fan favorites. Warming up for their summer festival tour, next up was the always fun and fabulous Pepper on the Main Stage. Bret rallied the crowd to get loud for the spirit of Bradley Nowell and lead the crowd in a sing-along of the Sublime song “Garden Grove”. While entertaining loyal fans, the band also announced their plans for an intimate after party at DiPiazza’s in Long Beach. The Hawaiian roots music of Landon McNamara, supporting his latest release Still Kickin', followed on the SMKFLWR Side Stage. Continuing with the good island vibes were Tribal Seeds, who you can catch on the upcoming 311 Cruise (because, let's face it, reggae on a boat is better). Mike Love’s unique sound and lyrics kept the crowd in the 'One Love' spirit. Be on the lookout for our exclusive One Love Cali Reggae Fest interview with Mike Love! Stick Figure then took to the Koi CBD Stage, playing their popular song “Breathe”. Bret Bollinger of Pepper joined them onstage for a high-energy set singing “Smoking Love”; Cocoa the Tour Dog joined the band onstage, as well. Being the only female performer of the day, three-piece band Bikini Trill served up great beats on the SMKFLWR Stage. Trevor Hall followed on the side stage, bringing his mix of roots and folk music, inspired from his numerous trips to India. One Love Cali Reggae Fest Night One closed out with the traditional ska-reggae sounds of The Delirians on the SMKFLWR stage as festival veterans Rebelution closed down the Main Stage. Attendees huddling for warmth were happy they stayed, since Don Carlos surprisingly joined Rebelution! The One Love Cali Reggae Festival returned for Day Two, with a cast of iconic reggae musicians. Rain or shine! The skies dumped buckets of rain in the early morning, but by showtime, the clouds had parted and the sun shone down. Philadelphia bred and So-Cal transplant Mike Pinto returned again this year to play the SMKFLWR Side Stage, bringing his unique horn-infused ska with a hint of punk rock sound. On the Main Stage, Huntington Beach locals Pacific Dub kept the crowds going in the cold with their message of love and peace, sharing that a new EP will drop soon with a new tour to be announced. Celebrating the release of their new album Old Time Something Come Back Again, Vol. 2, The Expanders brought their classic 70’s/early 80’s reggae style to the SMKFLWR Stage, covering a Peter Tosh song. South Carolina based reggae-rock band, The Movement, took to the Main Stage in anticipation of their new album set to release in the spring. The high energy antics of Mad Caddies got the crowd going and kicked up a pit over at the SMKFLWR Stage, while the bass from GRAMMY-nominated Matisyahu’s set on the KOI CBD Stage left your vision blurred and ears ringing. After, 82-year-old reggae legend, dub music pioneer and Jamaican music-producer, Lee Scratch Perry, entertained the crowd over on the side stage. Four-time One Love Cali Reggae Fest performers and fan favorites, Fortunate Youth, brought the crowds in droves while passing around a 15’ inflatable joint during “Pass the Herb”. Continuing with the theme of reggae legends, dancehall deejay Yellowman’s electrifying performance on the SMKFLWR Stage kept fans dancing. Arlington, VA based SOJA took to the Main Stage where the great Don Carlos joined them. The band announced that they have been off the road for two months, writing a new album. The indie/roots band, Dispatch kept things hopping on the side stage until the Huntington Beach locals Dirty Heads took their place on the KOI CBD Main Stage to share their new song “Listen To Me”. The ever-positive vibes of Pato Banton filled the air on the SMKFLWR Stage, while the distinct ska, punk-rock, funk and soul sounds of Fishbone rounded out the night. Closing out the KOI CBD Stage, Ocean Beach-based crowd favorite and One Love Cali Reggae Fest alumni Slightly Stoopid brought their reggae rock sound to a packed crowd, who danced and sang trying to stay warm. Don Carlos joined that set as well, making him the One Love 2019 MVP. Under dark clouds and rain showers, after two days of meet-and-greets, eager fans raced through the gates on Sunday to get to the KOI CBD Stage to see HIRIE perform. As the showers continued, HIRIE performed “Sun and Shine”, joking that it should be “Rain and Shine”. The band also announced that they are working on a new album. The now San Diego-based five-piece pop-reggae-fusion band, Mystics Roots, started out the day on the SMKFLWR Side Stage with a radiating show. Fans trudged through the mud to see Huntington Beach, CA favorites The Simpkin Project as they played through being cut off at the end of their set. We even caught Scott Clayton from New Leaf there in support of the band. With his latest EP release Moonlight Lovers climbing the charts, New Zealand reggae star Sammy Johnson followed HIRIE on the KOI CBD Main Stage with his eclectic reggae, ska, jazz and soul sound. Adding to the strong female presence at One Love Cali Reggae 2019, the dynamic Nattali Rize took to the SMKFLWR Stage for a high-energy set, impressing fans as she played jimba, pumping up the crowd who was already singing along. Continuing with the Ohana vibes on the KOI CDB Stage, was Oahu-based The Green, bringing their modern reggae sound meshed with traditional sounds of the islands. Back for their second visit to the festival and bringing with them their catchy alternative/hip hop vibes, Katastro followed on the SMKFLWR Side Stage. Supporting their latest album release, Washed, Katastro rocked fans in the rain. Quickly following on the SMKFLWR Side Stage was GRAMMY-winning Morgan Heritage: the band of five siblings who are touring promoting their latest album Avrakedabra. Back over at the KOI CBD Stage, Orange County Common Kings brought their feel-good vibes to get the crowd moving. As they played a cover of “Could You Be Loved”, the rain stopped and the sun tried to push through the clouds to shine down on the dancing crowd. Maui sweetheart, Anuhea, closed out the female performances of the weekend on the SMKFLWR Stage sharing her signature pop, R&B and reggae sound. Check out her latest album Follow Me: Deluxe Hawaii Edition! GRAMMY-nominated, crowd favorite and Long Beach native, J Boog started out the evening sets on the KOI CBD Main Stage. Fans sang along to classics like “Good Girl” and had surprise guest Fiji join the electrifying band on stage. The soul-filled reggae sounds of Josh Heinrichs kept the feel-good vibes of the weekend going on the SMKFLWR Side Stage that had fans grooving along. In anticipation of their upcoming summer tour, alternative/reggae group Iration kept the party going on the KOI CBD Main Stage as they lit up the crowd. One Love Cali Reggae Fest newcomer, Kyle Smith, took the crowd by storm on the SMKFLR Side Stage. With his latest single release “Astray” dropping in a few days, Kyle and his band showcased their talents and musical influences, tossing in a bit of punk in the mix which got a pit going in the rain and cold weather. Hopefully, you got your free EP at the show! After three-year hiatus, Groundation, the roots-reggae band from Sonoma County, returned with new members and new music. Blessing the side stage fans with an incredible set supporting their latest album The Next Generation, the band kept the crowd moving. The hip hop duo, Atmosphere, stormed onto the KOI CBD Main Stage as they returned to One Love Cali Reggae Fest with a vengeance, showcasing their deep beats and complex subject matter. The reggae punk rhythms of Southern California’s B Foundation could be found on the SMKFLWR Side Stage, with an electrifying show that kept fans dancing. New Zealand's Katchafire brought their roots-reggae sound to the fest, following the tour that was in support of their latest album Legacy and sharing their message of hope, love, family and togetherness. Following on the SMKFLWR Side Stage and closing out in true Ohana fashion, Fiji shared his Pacific Island sound. Combining his love of classic reggae, hip hop, jazz and R&B, Fii gave fans a high energy show, showing off his personality and why he is easily one of the biggest names in Hawaiian reggae. 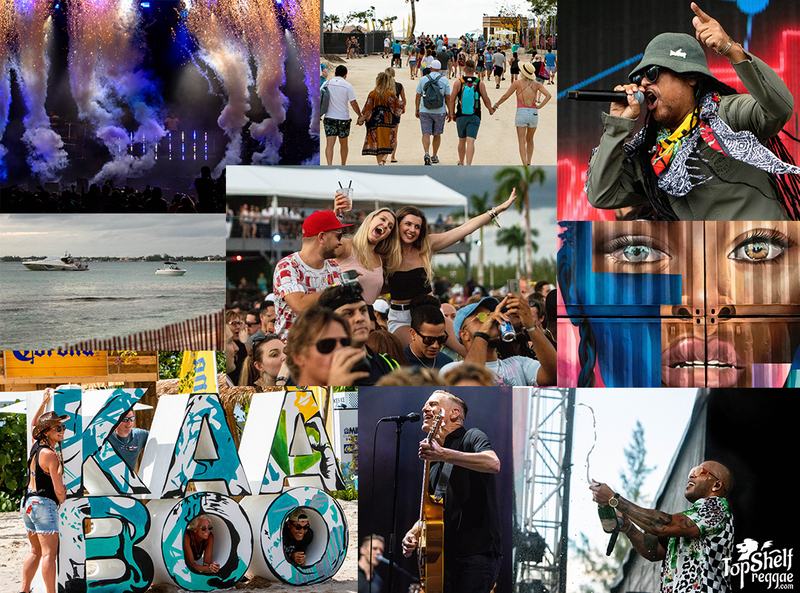 Knowing the influence that Sublime had in forming and creating a new sound of reggae/ska/punk, fans rushed back over to the KOI CBD Main Stage to catch hometown favorites Sublime With Rome as they brought One Love Cali Reggae Fest 2019 to a close. Supporting their latest album Blessings, the band played “Wicked Heart”. Look for the band to tour in a town near you soon, celebrating the 10th Anniversary of Rome joining the band. 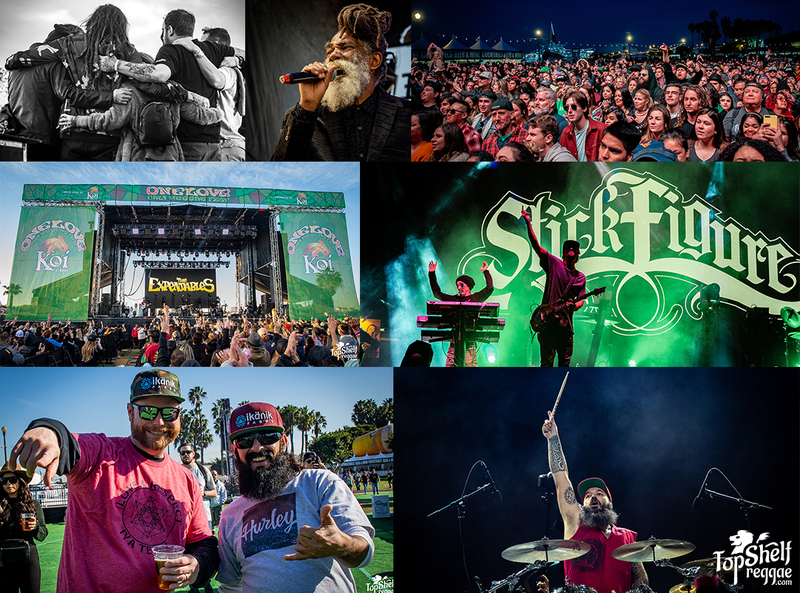 The 4th Annual One Love Cali Reggae festival showcased many different sounds and bands from around the world to spread the message of, as Fortunate Youth says it best, “Peace, Love and Unity”. Until next year! 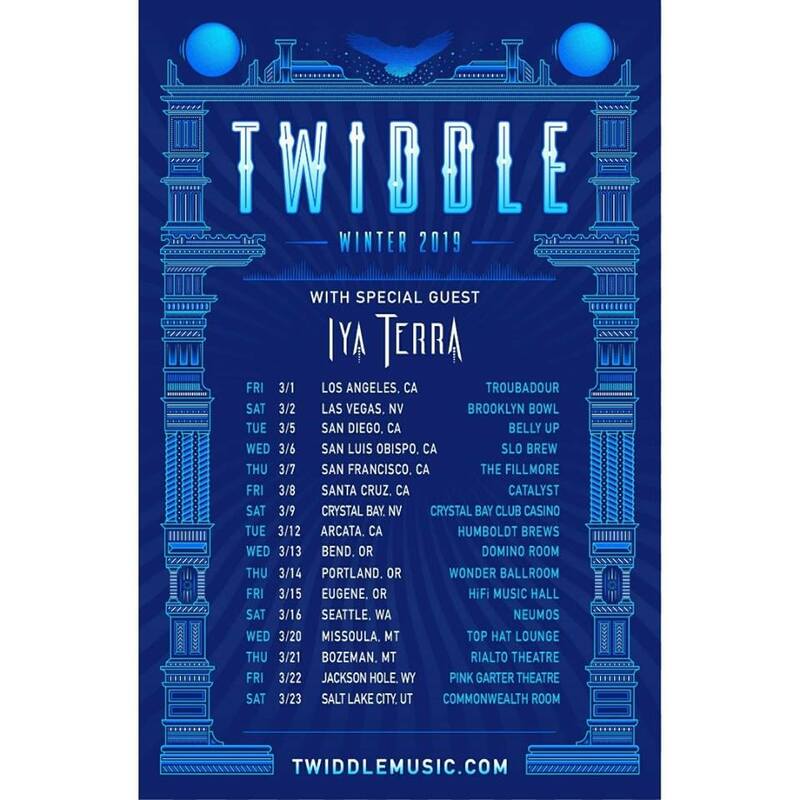 If you happen to be in the vicinity of West Hollywood on March 1st, do yourself a solid and head on over to one of LA's most iconic venues, The Troubadour, to catch what is sure to be an EPIC show by the four-piece band, Twiddle, and the boys of Iya Terra. The Troubador, built in 1957, is a venue bordering Beverly Hills and is well known for it’s folk, singer-songwriter and rock history. Shows there are somewhat intimate and if you’re well aware of all the legends that have been there before, then you can already feel the vibe in the air when entering this historical building. These two bands will be a perfect pairing for a great night of music. You can count on the opening and rising band, Iya Terra, to get the crowd going once their music starts playing. They always re-vamp their performances to make their sets fresh: never disappointing the crowd with their feel-good melodies, inspirational lyrics and strong showmanship. The jam band Twiddle has a fantastic live performance, incorporating many genres such as rock, bluegrass, reggae and funk. Each of the band members are phenomenal musicians, but if you have never witnessed Mihali master his guitar in person, you are in for a feast for your ears! These two bands will be a perfect pairing for a great night of music. This is the first show for these two bands, kicking off a month-long tour spanning the western part of the United States. Catch dates below!